"The most powerful of Keyblades. When equipped, it increases the speed at which the command gauge fills." Complete the Peering into Darkness battle. 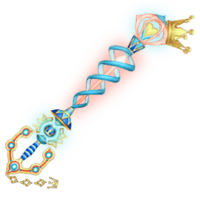 The Royal Radiance is a Keychain for Terra's, Ventus's, and Aqua's Keyblades that appears in Kingdom Hearts Birth by Sleep Final Mix. The three Keyblade wielders receive this Keychain as a reward for successfully defeating No Heart at the Mirage Arena. The Royal Radiance appears to be modeled after parts of the Mirage Arena. Its handle is covered in blue stripes, its guard is comprised of five gold gears with light blue centers, and a much larger, blue-white and spiked gear is set at the top of the handle. The base and tips of the blade resemble the Mirage Arena teleportation hubs and are connected by a light red beam that gives off a dim glow. This beam is surrounded by a light blue, double-helix structure. The tip of the blade is further decorated by a translucent sphere which emanates the same dim red glow as the blade. A gold crown resembling the one worn by No Heart sits off-kilter on the tip of the blade, forming the Royal Radiance's teeth. 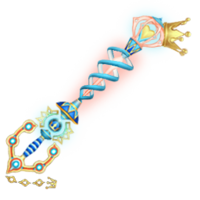 The Keychain has three gold links that connect to a charm shaped like a small, three-pointed gold crown, similar to the one on Sora's necklace, but with a gold circle on each of its points. This page was last edited on 3 April 2019, at 18:41.